Apple's main mobile processor manufacturer, TSMC, is reportedly set to begin commercial shipments of 10-nanometer chips in the next month —likely supporting claims that the "A11" processors in upcoming iPhones will use the technology. Shipments of 10-nanometer chips should grow rapidly in the second half of the year, co-CEO Mark Liu confirmed at a company forum according to DigiTimes. Apple is typically expected to ship three new iPhones in the fall, including an "iPhone 8" as well as an "iPhone 7s" and "7s Plus." Previous rumors suggested that TSMC had won orders to make a 10-nanometer "A11," and indeed other manufacturers such as Samsung are due to use the technology this year. The processor in the iPhone 7 and 7 Plus, the A10 Fusion, is built using TSMC's 16-nanometer FinFET process. Shrinking die size can be money-saving for manufacturers, and beneficial to end users as well, since it often results in more efficient chips with less power consumption than would've otherwise been possible. TSMC is meanwhile said to be planning "risk production" of 7-nanometer chips in the March quarter, switching into mass production in 2018 —possibly in time for that year's iPhones. 5-nanometer risk production is already slated for the first half of 2019. 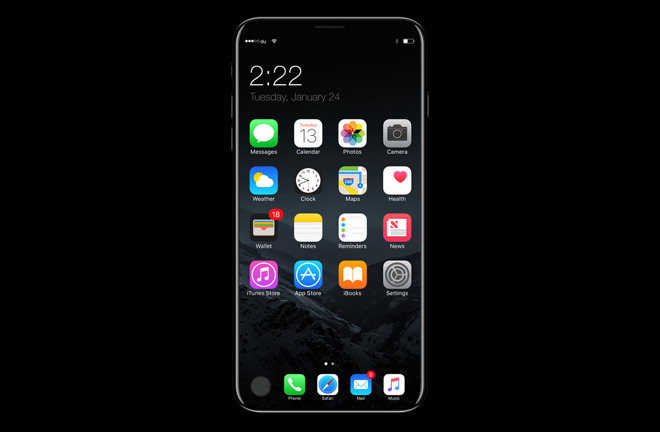 While the "iPhone 7s" and "7s Plus" will likely be evolutionary upgrades, the "iPhone 8" is expected to feature a 5.8-inch, edge-to-edge OLED display, of which 0.7 inches will be dedicated to virtual buttons, replacing the physical home button Apple has had since 2007. The phone may also have 3D facial recognition and/or iris scanning.